It’s all because of Facebook and its memory feature. It, in some ways, can be that painstaking reminder of the life that you left and the life that you’ve currently chosen to live. Curious of the random image from five years ago that came across my social feed; Darco and I dived deeper into the world of a time when we didn’t know one another. Through the past posts of five, ten years went by. Resulting in at least one prior post on this day from FilingThePapers. The story revolves around one of my journey’s with Subway. I traveled deep into the southern part of our region. I went back into the town that I called home during college and enjoyed sushi for the first time since my divorce earlier that year. There’s so much to be thankful for, as illustrated in the post. However the writing of the past doesn’t even compare to the undeserving manner that my soul currently resides in; in this strange euphoric realm that allegedly is referred to as ‘life’. As strange as it sounds, I try earnestly to forget the world that once was. I purposefully try to forget about people, events, actions of the past in hopes of allowing scars to become hidden. I love waking up in the morning, forgetting that I’m divorced, that I had a life before this one. I’m not sure if that’s the Christ-like attitude to have, but the present is so much clearer, wonderful, and truth-be-told it’s so, so much sweeter. Jobs have come and gone, apartments have disappeared with friendships, and lifelong connections have grown like the licking flames in this evening’s fireplace. Darco and I sat on our living room couch tonight, staring at our fireplace while the cats laid in front of the mantel. Toasty, warm, and safe. It was one of those moments where words weren’t even required, because everyone was at peace within the house. Last night Darco and I spoke more about the fact that there’s nothing deserving in the lives of ourselves that should allow us to be in this house. There’s no reason that we should enjoy a fireplace at night and the country sun during the morning. She shouldn’t have an amazing job that she loves in the coffee shop, and I shouldn’t be able to enjoy walking into a classroom every day. Too many times we stare into each other’s eyes wondering whose lives we’ve taken over. I was alone and she was lost; how did we come to this moment? There’s no equation, logic, or solid answer. It’s only God. How on earth could I stand before the multitudes and foolishly try to answer with any other key? How could I state that my hard work has equalled this moment of tranquility? I can’t! Whether it’s sushi from four years ago, or a fireplace tonight, I will never be able to express how glorious my God truly is. Back in the day I dreamed of being a storm chaser, working in the National Weather Service, and stare at the computer screen all day (I wound up doing one of those three as it turns out). However, three years ago everything changed for me. I was eating dinner in Springfield, Missouri when I looked at my radar, seeing a nasty looking cell moving through the Joplin, Missouri area. I had no idea what had taken place until my boss at the time called me, asking if I would take my truck along with a bed full of water and Powerade, and head into Joplin. Working for Subway at the time, I learned that the our Subway in the Walmart had been destroyed and several people were displaced. Upon arriving to Joplin, a city I knew very, very well over the years, the absolute horror completely changed my perspective of myself, the weather, and meteorology as a whole. Truth is that I couldn’t stomach what I saw. Below is a video that I shot upon my arrival in Joplin; there is no blood, gore, etc…but it’s 14:00 worth of what the town looked like so quickly three years ago. Please take a moment to sigh with me. I suppose as it is proper to keep with the tradition, yet incorporate the new styles of life [technology], and being the ‘writer’ of the family, it’s been shown, my destiny, of writing the family Christmas letter. Hanging out; we’re best friends. Currently, while writing this I find myself in a strange, foreign world. Darco is sitting on a couch working on some accounting work, and Ollie, our cat, is roaming around the living room. Aiming to get in trouble I’m sure. It’s been a whirlwind of a year for the Daugherty name. In the beginning of 2013 I, D, found myself in a relationship with a wonderful barista from Starbucks. I’d spoken of her before, but few of my family and friends had ever met her. We were attending a wonderful, small church in the middle of a cornfield, and we were preparing for the beginning of the Kansas City Shock. I was working at Subway, and for the past several months had been living in an apartment in St. Joseph. Darco was living with her mother in St. Joseph, and due to her health, we had already experienced some family frustrations in February with her winding up in the hospital. Darco’s mom was having problems exhaling the CO2 from her body, not good on the human condition it turns out. Party out in the desert of Nevada! February led to the first big adventure of Darco and myself. We boarded a flight, and went to Las Vegas, Nevada for a soccer meeting. This also resulted in a 8 hour [one way] trip to Reno, Nevada…and back, in a 24 hour time period. Somethings we learn the hard way, and making stupid trip like that would be one of those mistakes. March was the second round of tryouts for the Kansas City Shock, an incredible experience watching the future team come together through the tryout process [especially when you know nothing about soccer]. It’s incredible how fast things can change, and how dramatic they can be. In May our head coach for the Kansas City Shock stepped down, a week before practice was to begin. Quite the shocker, and praise be to God, we were able to find a coach the night that the former left. Life was a little stressful in May. Darco was working at Starbucks, and was also attending the University of Phoenix. I was working with Subway, and I had just completed a new experimental course through Subway showing that I mastered the understanding of management systems within the Subway corporation for franchises. On June 1, life started to become a bit more fascinating. I was asked to resign my position with Subway, ending a ten year commitment to ‘eating fresh’. While most people I do not miss from that job [honestly], I still am forever indebted to my mentor, Ro, for everything she did for me over the ten year time span. I think she’s retiring next year, and she was an incredible blessing while I tried to understand the corporate world. It was quite the eye opener of figuring out what I should do next in life. 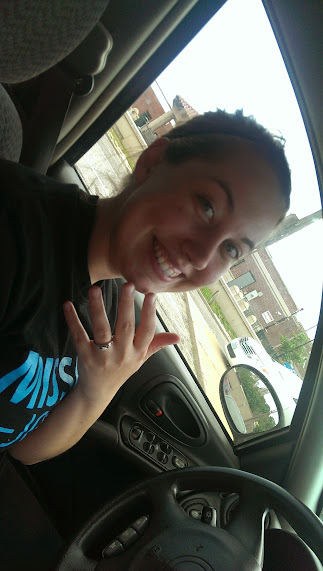 The next day, while eating pancakes at the apartment, Darco and I decided that we would go get engaged. So, by the end of the week I had lost my job, lost my car, and became engaged to a beautiful woman. Life is strange like that. We had a short engagement, resulting in our marriage on August 2, 2013 at Missouri Valley Baptist Church. We were going to adopt a cat. So, now we have a three year old cat in our apartment with us. Most times he’s tolerable, and only between 8:00 PM and midnight is he a pill [he tries hopping on our flat screen TV…for fun]. Between leaving Subway and getting married, Darco and I watched the Kansas City Shock grow into its first season in the Women’s Premier Soccer League. We added a minority owner, Steve, and also added 101 acres of land to our portfolio. The goal is to develop this acreage into a soccer complex in the northern tier of the Kansas City region. Needless to say, this is quite the challenge. The team did well, we finished the season with a record of six wins and three losses within league play. We were the only new team to qualify for the playoffs, and halfway through July I found myself driving a passenger van into Ohio with a bunch of soccer players. Talk about a dream come true. Why wouldn’t Starbucks be involved with wedding photos? She always pulls the perfect shots. Upon August, Darco and I had been praying for the direction I was to take my employment. At the same time, Jim had watched his plant shut down in St. Joseph and was in a similar situation. Thankfully, between Darco, myself, MC, and Jim we learned and saw how powerful and uplifting family can be. I went back into the classroom as a substitute teacher within the North Kansas City School District. Darco, on the other hand, continued her job at Starbucks, and was notified that it is time for her to move up within the company. Through several meetings, discussions, and surveys she’s quickly moving rank to become an assistant store manager in the company. The likelihood is that she has the opportunity to become an “ASM” before she’s even of age to consume alcohol. She continues to amaze me. I started back into the classroom on the first day of school at Staley High School. Overall, in August, September, and October there were only two days each month that I wasn’t in the classroom teaching. The strain was obviously the gas mileage traveling every, single day. Darco and I started to discuss the potential ideas of moving to Kansas City. She would eventually relocate to a Starbucks in Kansas City, the substitute teaching was in Kansas City, and our soccer team is in Kansas City. To added coals to that fire it became known that a teaching position, full time, was about to open up at a school that I spent the majority of the time in. It, in many ways, was a dream job for me, and Darco was ecstatic also. Life was calming down, doors were opening, and everything made sense. One way or another, I would finally wind up in a classroom. True Story: This electric sign was attached to a shirt that acted as a synthesizer to noise. It was epic. This was a life changing opportunity. Instead of teaching I wound up in a job maintaining the social media accounts of two Mazda dealerships, a engineering education firm, an office complex, and a real estate residential development. Jokingly, I get paid to operate Facebook accounts. Realistically, the portfolio I created with the Kansas City Shock paid off incredibly big. I have three offices that I float between in Lee’s Summit, Overland Park, and South Kansas City. This all took place during Thanksgiving. Upon receiving my first paycheck I mistakenly took Darco to one of the dealerships with me, I had to correct a few photos, and then we’d go out on a date. While working on a photo my wife came to me and said, “What’s your social security number?” In a car dealership that can only mean one thing: financing. Incredibly, my wife went out and found out that we qualified for a wonderfully good deal from Mazda on a new car. So, two days later we drove off the lot in a bright red, 2013 Mazda3. If nothing else, the 41 miles per gallon impress me, but the car is wonderful. This adventure has led to new concepts, ideas, and plans with the Kansas City Shock that I can’t share…yet. With so many things changing, so quickly we started making some internal choices as a family [Darco and myself]. We moved church bodies, which was very, very hard on both of us. We’re now attending a wonderful church in Smithville, Missouri with my parents. It was opened up more time with the family overall, something that was greatly missed. We also made an announcement to friends and family that we will, 100% certain, be moving to Kansas City in 2014. While St. Joseph has done so much for both of us, especially with Darco growing up here, it is time for us to move on. As a brief recap: Darco’s up for promotion with Starbucks, I left Subway after ten years, started teaching, left teaching, is now paid to operate social media feeds, the Kansas City Shock actually started a real season, we adopted a cat, and wound up with a new car. If this was 2013, I can only chuckle at what is to come in 2014 for “Club Daugherty”. As a reminder, we’re located online. You can keep up with our family adventures throughout the year at our Google+ page. I went two for three. I find it fascinating that this time last year I was wrapping up the first volume of FilingThePapers; the section well known as “X“. The primary focal point about the immediate recovery of divorce and moving on in my own life. With the adventure of Guatemala really making its mark of a year from the divorce; I started over with volume two, labeled “O” [Get it yet? X’s and O’s?…hehe…]. The second volume really emphasized growth, it wasn’t aimed so much at reflection as much as it was moving forward; most notably the theme tended to unintentionally revolve around the creation of the Kansas City Shock and seeing God’s hand do marvelous, inexpiable things with the program, including the kick-off of this sports team just a few weeks ago. I never really thought about where “O” would end. With “X” I had a game plan, a blue print, an idea of how to wrap it up. How do wrap the continuation of ones life? I think my girlfriend answered it without realizing it. It’s been a crazy, crazy week. On Monday, after ten years of service, I stepped away from Subway for good. It wasn’t planned to be this prompt, but it was coming. There were several factors adding to the eventual moment that took place on Monday, some on my end some on my employers end. Insanely “Mobile Minutes: Equipment Check” really was a key for me. I went into Monday’s meeting knowing that there was a strong likelihood I’d leave without being employed with Subway. Because of that it really didn’t hurt when the truth came out of what was taking place. Now, in this process I did lose the company car and the ultrabook [laptop] because they were company property. I’ve been adjusting, but am already looking for own ultrabook because I like my eight year old laptop…but it is just that…eight years old. Thankfully, God has blessed me with a truck that won’t die. Seriously. It was over 268,000 miles on it and I witnessed my family [MC primarily] put each one of those miles on the truck. It’s been good to me, and in the worse case scenario, it gives me transportation. Now, if I need to go down south, to the city, or a business trip I’m further blessed with my girlfriends car in those instances until something else gets figured out. Unlike being jobless a few years ago, I do have money to get me through comfortably the next 90 days while I work on additional employment. I really, really wish there was a way for the Kansas City Shock to be my full time job, but currently it’s a new business and because of that, the money isn’t there yet. That’s alright, because also unlike last time, I know God has my back and He has something incredible in store for me. Some applications I’ve put in I’ve already started to hear back from [whether that employer knows it or not]. I will confess that I’m strongly aiming at the soccer market. Because of the Kansas City Shock, my calling, ministry, and life…that’s where I know I need to be. Now, we’ll just see how God wants to plan it out. It was kind of sad to see my supervisor off from Subway, she’s a God fearing woman who has known me most of those ten years. However, outside of her and a few others, there wasn’t much of a connection with that company so stepping away wasn’t too hard. As I explained to MC over lunch on Monday, Subway did exactly what it was supposed to do. It moved me from Point A [divorced, alone, stuck down south] to Point B [the city, a family, and a new life]. When you see what God has done with a job, and how short life is compared to eternity, it doesn’t sting as much [aside from the car being gone]. The staff with the Kansas City Shock knows that I’m gone from Subway, but I’m very, very fortunate that my earnings from Subway were not the direct ‘lifeline’ of finances for the Shock. This assists in knowing that, that program isn’t negatively affected by this transition and it continues to move smoothly. Girlfriend: I don’t know, what do you think? D: Not sure. Want to get engaged? Girlfriend: I wonder if Kay’s has that ring I like in stock. D: We could grab it today. Let’s go look. Girlfriend: Let me call first. Girlfriend: They don’t have it in stock, and it would require at least three days to get here. D: Want to go see if there is one that you may love more that’s in stock? Girlfriend: Are we seriously doing this? At the register, processing the paperwork, the lady asked if I would like to put the ring on her in the store. Naturally, I declined the offer and just had it boxed up and placed in the sack. Incredible, through all these ‘reckless’ moves, I did have a plan. When I was little there was a spot next to the Missouri River that I loved going to. No docks, no houses, nothing, out in the country right next to the giant body of water [I even had senior pictures taken there]. It was my secret spot, even at the age of 25 I rarely took anyone to that location. It was a place, in Kansas, that meant the world to me and I could escape everything. In my girlfriends case she has a undying love of rivers and bodies of water; reasons of which I’ll never understand. It only makes sense that we took a short five miles jog across the river to this secret spot. There was no candles, no cameras, in fact I was in running clothes and she was in mismatched work/comfort clothes. Honestly, we were a humorous mess that anyone could tell that the day before took an unknown toll on each of us. In that mess and near the body of water that both of us relate to so well, I got down on one knee and just asked her to marry me [not as easy as it sounds, because understand this…those who never have…you will get nervous]. Insanely the ring didn’t need to be resized at all and it was a perfect fit. Afterwards, we went and worked out [true story] and then surprised my mother at her house. Somewhere in the mix of this Facebook went nuts with a photo and congratulations galore [thank you all! ], and we just entertainingly laughed the night away because we did something unpredictable. I can safely say at least 99% of the people who know us would not have seen that one coming, and that’s fine with both of us because through this whole crazy process we made sure that we were doing something that we orchestrated not dictated by anyone else. That is more liberating then even walking away from a job. For those of you who’ve just now discovered this page you should do some digging, and see what this was all about. For those of you who have been with me since day 1, thank you for the support, prayers, and for humoring me on my careless adventures. That is one happy chica! FilingThePapers isn’t going anywhere, I’m definitely not ending the site [it’s far too fun], and I’m already knee deep in the first draft of “X: Dare To Be Different”. Note: If anyone ever got confused, I would like to clarify that my girlfriend is indeed the same person that is referred to as Darco throughout these posts. What’s even more incredible is I’m marrying the same girl that I had the honor of leading to Christ one night in the parking lot of Starbucks. Like anyone else, the result or the aftershock of today’s events are finally starting to set in. I’ve been working on my resume, applications, and cover letters throughout the day. Figuring out my new ‘budget’, and making adjustments to the Kansas City Shock as needed. I don’t feel worthless, or sad. There’s a ton of questions currently, but knowing how stressed MC and my girlfriend are about all of this…that in itself tends to bring upon a new level of stress. I don’t have the answers, I don’t really know what to do, I don’t even know what my resume should even look like. I mean, what tools and knowledge do I actually have? Ugh…frustration is creeping in a bit tonight. Darco has been working on some tea, and groceries were purchased. I will not repeat my mistakes. I will not be out of a home. I will have food to eat. I will survive. I am not familiar with the military, and for that I apologize. However, with two cousins that went through the Air Force Academy I did get to hear about all sorts of fun stories along the lines of room checks, equipment checks, and everything else you can imagine [or at least I imagine]. I received a text from my supervisor with Subway informing me of an equipment check tomorrow at a late morning meeting. Now, our equipment consists of laptop, printer, car, iPhone, and their respective cables. I’m sure on the grand scheme of things this is very routine, but guys…I’m scared out of my mind. I know I’ve made this mention before, but meetings with anyone of Subway makes me super nervous. Per usual I can’t express how grateful I am for the job that I have, but if you’re ever curious on the stress that I bring upon myself with the position…it tends to be unreal. Primarily because I hate making mistakes, and I know that I make mistakes at work. Stupid mistakes, whatever they may be. And these meetings constantly remind me that I make mistakes and like anyone else…I grow fearful of how many mistakes I make before I’m expendable to a company. Not to be dramatic, but it is something that constantly crosses my mind. Trying to give 100% with Subway and 100% with the Kansas City Shock is just hard [like anyone would say I’m sure], and it increases the percentage chance of error within both institutions. Almost feels like a catch 22 on several occasions. It’s not like there is anyone to blame for th eset up, I mean come on; it’s on me. I guess realistically, I just hope people can be patient with me. Not just within organizations, but in life as a whole.